Roller Shades are a great solution for large or small windows. With many existing options, textures, colors and patterns they can satisfy most designer needs. Multiple opacity levels allow you to cover your windows with the right amount of sun protection. 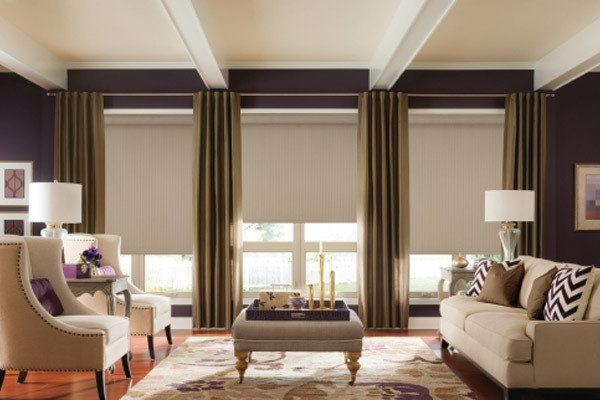 Whether you’re looking for a translucent and airy sheer fabric, or light filtering for a soft outline, to a room-darkening or full blackout shade, Roller Shades can offer you all of these alternatives. If you can’t decide, fabrics can be paired as a Dual Shade, offering you a great degree of versatility. Our Roller Shades can also be combined with sliding panels to create a uniform look throughout any room. They are great in a commercial setting because of their ease of use and ability to be motorized. With their clean lines, Roller Shades are a smart solution for any room.